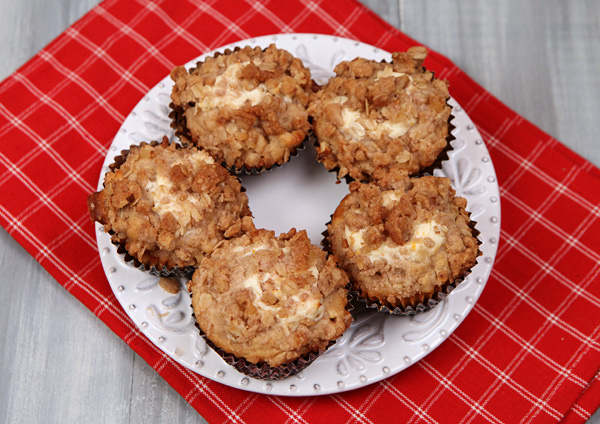 I came across these apple muffins with a cream cheese filling and a streusal topping in a Taste of Home magazine, and they looked so good I had to give them a try. I made a few changes in the recipe as I actually was trying to rebuild it to make it healthier, and by the time I was finished, the muffins turned out so well that I do not think anyone would know the recipe was adapted. These muffins would be great one a holiday brunch buffet table, or as a snack to keep you going on busy days. I made a double batch of these muffins and froze one batch to serve over the holidays when we have all the family staying with us. 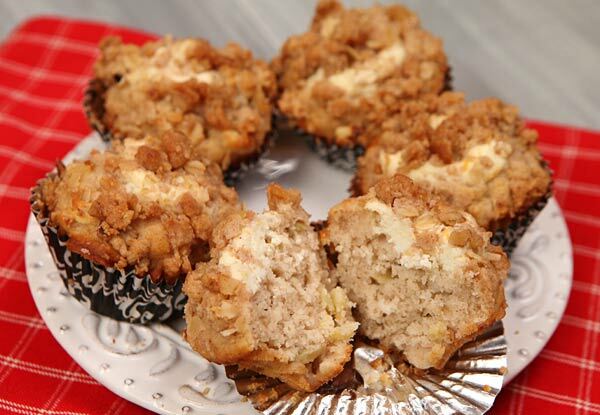 The grandkids love muffins and I know these apples muffins will be a big hit. Once frozen, the streusal topping will not stay as crisp, but the muffins will taste just as good! The ingredient list may look a little long in this recipe, but the muffins are really easy and quick to assemble. I usually use Granny Smith apples for my baking because I love their tartness but for this recipe I used Honeycrisp apples and they worked out great. I used olive oil as the primary fat which is a heart healthy fat. Changing the cream cheese and milk to lower fat options cut a good deal of fat calories without sacrificing tastes. Wanuts and oats both add important nutrients to any recipe they are used in. A moist and tasty muffin that would be great any time of the day. In one bowl, combine the flour, sugar, baking powder, salt, and cinnamon and stir to mix. In another bowl, whisk together the egg, milk, and olive oil. Stir the dry ingredients into the egg mixture just until moistened, then fold in the chopped apples. Fill lightly greased or paper filled muffin cups 3/4 full with the batter. In a small bowl, stir together the filling ingredients. Drop a tablespoon of the filling onto each muffin. Combine the topping ingredients in a bowl, and rub together with your fingers until crumbly. Sprinkle the topping over each muffin, and then bake for 20 to 25 minutes, or until the center is set when a cake tester is inserted. Cool for 5 to 10 minutes, then remove from the muffin tin.